...now the bat is used for hit the burglars if they come. i put my bat under my bed. Thanks, now I know where to look. Not nearly as good as Rey's but I think I got pretty good results. Lightning inspired by the movie "The Natural" and his "Wonderboy bat"
Sweet!!!! I love the colors! Maybe soften up the lighting bolt a little. It's a bit sharp. Also remove some of the highlight from inside the bolt and instead of black for the bevel and emboss, pick a nice brown. But it's beautiful. Where is the other end of the bat??? So cool to see Rey explains and others picking up the ball (pun intended) and running with it. Nice tut and creation, Rey, nice work Tofu. Sometimes I really DO feel the love here. That's what you said in the prison shower. ok here was my shot at it.. 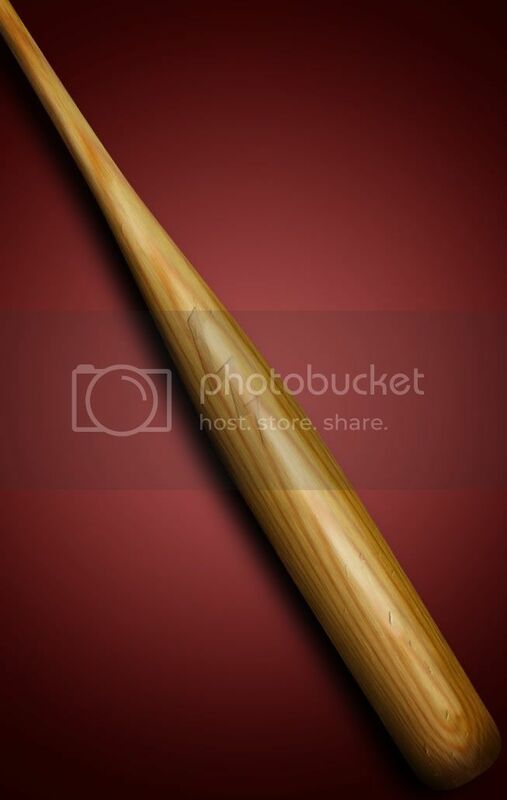 I think they outlawed using those types of bats in the major leagues.. I could be wrong though..
Nice self portrait, nancers . . . . . . . . . . D'OH! so how many bats do you guys think we'll see in the next week of contests?! GREAT TUTORIAL REY! You are too good to us lot! Oh and about the knob... I had one at first but it didn't look right. So I cropped it out.